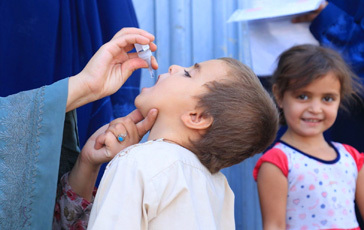 Reaching children with polio vaccine can be notoriously difficult and dangerous. 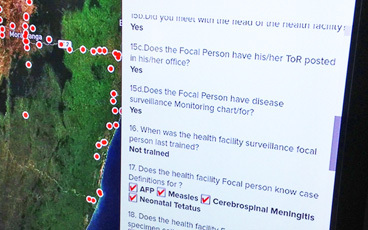 In fact, polio transmission and outbreaks in some areas can be directly related to inaccessibility. When we talk about inaccessibility, many people think about insecurity. And that is definitely a critical factor in some areas, for example in Borno, Nigeria, or Syria at the moment. But in most areas, other elements contribute to the difficulties faced by vaccinators in reaching every child with the vaccine. For example, children living in dense urban neighbourhoods or children who are part of nomadic or mobile communities are often hard to reach. In some parts of the world, significant environmental and geographic challenges make it difficult for vaccinators to reach children. It is important for health workers to be aware of these different physical barriers when planning vaccination campaigns, as each requires different strategies to make sure we reach even the hardest to reach child. 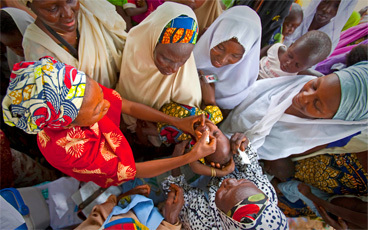 Many countries working to vaccinate their children against polio have a dry season and a wet or rainy season. When the rains come they can be relentless, altering the landscape and the environment dramatically. For example, rivers that are easily crossed can become torrents of rushing water, impossible to traverse or to even see across. Populations can be suddenly cut-off for months at a time, and reaching them with vaccines becomes much more difficult. The polio programme must then adapt to the local physical landscape and come up with solutions. One of the last hideouts of wild poliovirus in India was the floodplain of the Kosi River in Bihar state; the virus was stopped here by careful planning of vaccination campaigns, mapping of temporary settlements and increasing the number of personnel on the ground. Infrastructure factors can affect access: children can live in extremely remote locations in places where there are no roads or easy means of transport. In parts of the Democratic Republic of the Congo, some settlements are deep in dense forests, and are not clearly mapped or identified. 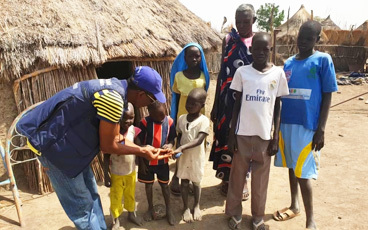 Says Mohammed Mohammedi, polio eradicator since 1997, “In some countries, we simply might not even know where exactly these places are or if children live there, not to mention the challenge of actually reaching such remote environments. Rains can turn dusty roads in to muddy swamps. 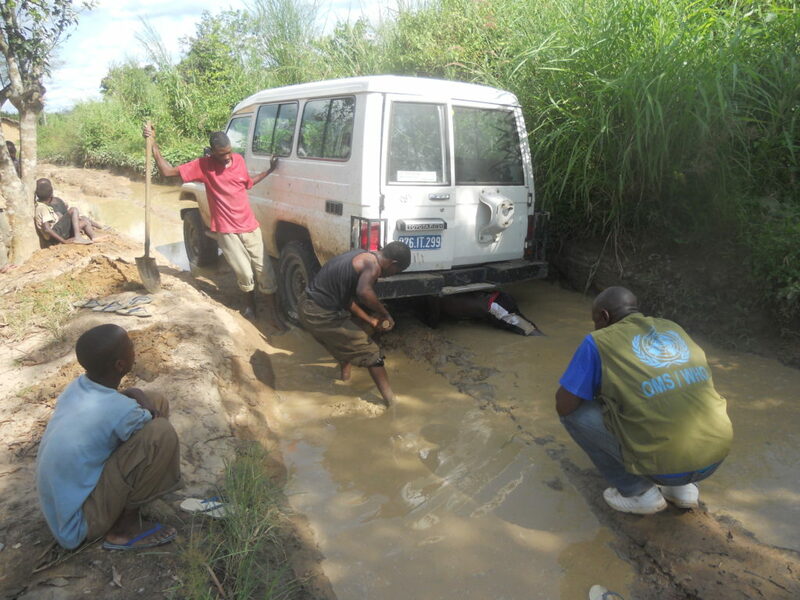 Cars and other vehicles risk getting stuck in the mud, causing significant delays to operations.” The polio programme overcomes such challenges with both old-fashioned means – muscle power to dig out vehicles from the mud or donkeys to transport vaccines – and new tools such as satellite imagery to find human habitations or airlifting in vaccine with helicopters. Mohammedi advises, “For the environmental factors, forward planning is key. We try to schedule vaccination campaigns right before the rainy season starts, and right after it finishes.” The rainy season often coincides with ‘high season’ for polio, with increased transmission during these wetter months, so the pre-rainy season campaigns are critical to make sure children are protected, even when populations become cut off from vaccinators. In some places, vaccines are pre-positioned ahead of the rains, so that local health workers can continue to operate in those areas once regular access is cut off. 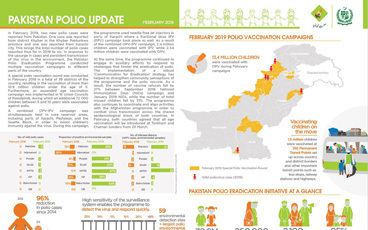 The programme has years of experience responding to a whole host of inaccessibility factors, and is constantly using this knowledge to make sure every child is immunized against polio.